Tatton Rattan Companion Set: This stylish two seat companion set is ideal for using on the patio or in the garden to enjoy a drink on those warm summer days. 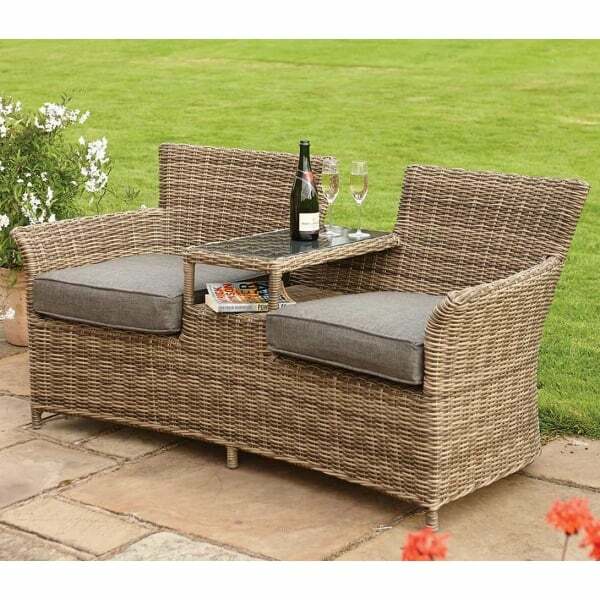 The attractive set features a half round synthetic rattan weave which is easy to maintain and there are padded seat cushions to provide extra comfort and support. There is an integrated rattan weave shelf between the seats, ideal for storing a magazine or book, above which is a small glass topped table onto which can be placed a cup of coffee or glass of wine. The powder coated aluminium frame is rust resistant and and this charming companion set includes a 1 year manufacturer's warranty. Store cushions indoors during the winter months.